A new book for a new generation of expectant moms--featuring a new look, a fresh perspective, and a friendlier-than-ever voice. Facts, Tips and Advice for Dads-to-Be. An information-packed, month-by-month guide to all the emotional, financial, and yes, even physical changes the father-to-be may experience during the course of his partner's pregnancy. Your Pregnancy Week by Week, 6th ed. Your Pregnancy Week by Week is the most medically current and comprehensive pregnancy guide available. Doctors recommend it. Reviewers praise it. Pregnant couples rely on it. Download today! The Ultimate Guide to Conception, Birth, and Everything In Between. The ultimate guide to conception, birth, and everything in between. The body pillow from Leachco was designed by a registered nurse to meet the needs of expectant and new mothers. You've got nine months to prepare for the challenge of your life. Use every minute! Nine Months of Practical Tips, Useful Advice, and Uncensored Truths. 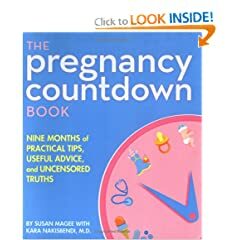 The Pregnancy Countdown Book starts on Day 280 and counts down the biggest milestones every step of the way with one page of helpful information for each day of your pregnancy.